But let’s not ahead of ourselves here. Let’s start from the bottom and work our way up to the number one spot, shall we? I bet you'll get a laugh out of some of these fails. April Fools' Day gives tech companies the chance to let down their hair and show the world they have a funny side. Google in particular has made it a tradition to put out as many pranks as it can. Out of all the pranks Google pulled this year, one stands out: the Gmail Mic Drop prank. It’s purpose was to let you have the final word in a conversation. But… things did not work as intended. People did not realize that using Mic Drop would mute the conversation. Or they used it by accident on serious emails and came off as unprofessional. Once all the negative feedback reached Google, the company quickly axed Gmail Mic Drop, saying that the "feature inadvertently caused more headaches than laughs." With John McAfee having become infamous for his legal troubles, I can certainly understand why Intel would want to distance itself from the McAfee name. Unfortunately for Intel, that’s not going to happen. Not for lack of trying, mind you. Here’s a quick history lesson that explains everything. Back in 2010, Intel bought McAfee for $6.8 billion. In 2014, Intel decided to rebrand the security company as Intel Security. In September 2016, Intel announced that it sold its majority stake in Intel Security to TPG, meaning that Intel and TPG became the joint owners of an independent cyber security company that will be named, drum rolls please, McAfee. "As we collaborate with TPG to establish McAfee as an independent company, we will also share in the future success of the business and in the market demand for top-flight security solutions, creating long-term value for McAfee’s customers, partners, employees and Intel’s shareholders. Intel will continue our collaboration with McAfee as we offer safe and secure products to our customers," said Intel CEO Brian Krzanich. John McAfee isn’t happy about this. He’s asked a court in New York to order an injunction on Intel’s deal with TPG because he wants to found a new security company and name it McAfee. This summer, Turtle Rock Studios tried to breathe some new life into Evolve, its first-person shooter video game, by making it free-to-play. It didn’t work! Consequently, Turtle Rock had to axe the game. "Seems like the greater things you aspire to, the more time it takes. We had huge aspirations for Evolve, and while we got to spend five and a half awesome years on planet Shear with a ragtag group of Planet Tamers and fearsome Monsters, it still doesn’t feel like enough - we were hungry for more but unfortunately today is the last day that Turtle Rock Studios can work on Evolve," said Turtle Rock Studios co-founder Chris Ashton. Back in November, German media uncovered that Web Of Trust (WOT), the company behind the browser extension that’s meant to protect against dodgy websites, collects and sells user info to third-parties. Worse than that, WOT didn’t even bother to properly anonymize all this data, meaning that things like email addresses, travel plans, and even sexual preferences could easily be linked to individual users. The security community responded by advising users to uninstall the Web Of Trust extension. Google, Mozilla and Opera responded by removing the WOT extension from their respective add-on stores. Bing claimed to know who would be the next US president. 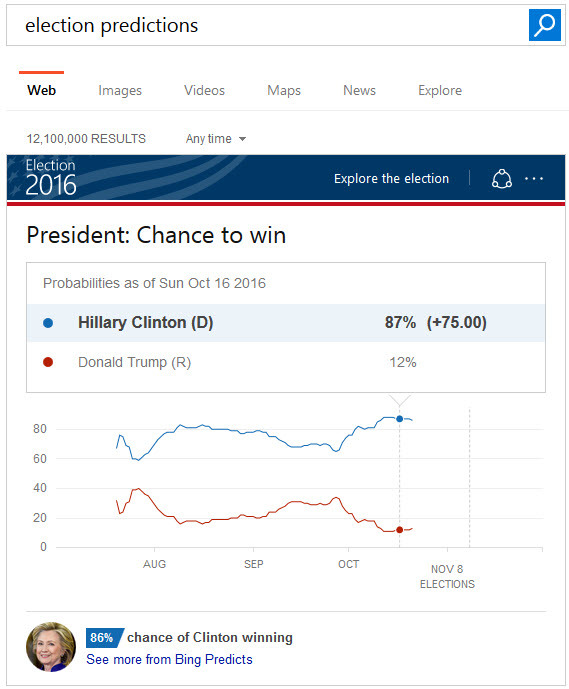 Before the 2016 presidential elections, Microsoft’s search engine predicted that Hillary Clinton had an 87% chance to win, while Donald Trump had a mere 12% chance to win. Since the elections are now over, we all know that Bing’s predication did not come true. That isn’t the only prediction that Microsoft got wrong this year. According to Cortana, the Carolina Panthers had a 64% chance to win the Super Bowl. But they didn’t. The Denver Broncos won Super Bowl 50. On the bright side, Microsoft’s prediction that Leonardo DiCaprio would win his very first Oscar did come true. He won Best Actor for his role in The Revenant, just like Bing predicted. This year, Apple decided that the iPhone doesn’t need a 3.5mm headphone jack. Consequently, the new iPhone 7 doesn’t have one. And that’s okay, because there are other ways to keep using your old headphones with the jackless iPhone 7. What’s not okay is Apple defending its decision to remove the headphone jack by citing courage. "It comes down to one word," said Apple’s marketing chief Phil Schiller. "Courage. The courage to move on and do something better for all of us." As VentureBeat points out, "it is the same kind of courage that enabled Steve Jobs to kill his best-selling iPod, the Mini, and replace it with the Nano. It is the same kind of courage that it took to release a new laptop, the MacBook Air, without an Ethernet port. It is the same kind of courage that it takes to kill CD/DVD drives in desktop computers like the iMac." The new MacBook Pro got it worse than the iPhone 7. Apple removed the MagSafe 2 charging port, the HDMI port, the SD card slot, the Thunderbolt 2 ports, and the standard USB port, replacing all of them with four Thunderbolt 3/USB-C ports. No Man’s Sky, Hello Games' action-adventure survival video game, was one of the year’s most hotly anticipated titles. Everyone was super hyped about the game and was eagerly awaiting to get their hands on it. But once they did, they soon uncovered that the game was buggy, crashed a lot, and didn’t offer all the features that had been previously advertised. Hello Games founder Sean Murray received a great deal of online criticism from players, including accusations of lying. Things got so bad that on the 28th of September 2016, the UK Advertising Standards Agency (ASA) launched an investigation over false advertising into the marketing of No Man's Sky. Visit No Man’s Sky Steam page and you’ll see that the game has over 80,000 reviews. But only 30% of these reviews are positive. Back in September, Yahoo confirmed all the rumors which said that it had been hacked and the user credentials from 500 million users had been stolen. Yahoo explained in a press release that the hack occurred in late 2014 and that the information that was stolen may include names, email addresses, telephone numbers, dates of birth, hashed passwords and, in some cases, encrypted or unencrypted security questions and answers. This week, Yahoo shocked everyone when it shared information about a second hack. The company explained that data associated with more than one billion user accounts has been stolen during a hack that occurred in August 2013. "Yahoo encourages users to review all of their online accounts for suspicious activity and to change their passwords and security questions and answers for any other accounts on which they use the same or similar information used for their Yahoo account," says this press release. "The company further recommends that users avoid clicking links or downloading attachments from suspicious emails and that they be cautious of unsolicited communications that ask for personal information. Additionally, Yahoo recommends using Yahoo Account Key, a simple authentication tool that eliminates the need to use a password on Yahoo altogether." Verizon might want to think twice about buying Yahoo for $4.83 billion. No one’s going to blame them for walking away, not now. The Galaxy Note 7 was supposed to be one of Samsung’s best mobile devices and a considerable improvement on the previous model, the Galaxy Note 5. Unfortunately for Samsung, the Note 7 had a "little" defect that’s kind of hard to ignore: the device spontaneously combusted. Due to a problem with the battery, the Galaxy Note 7 caught fire. Samsung recalled it, investigated the issue, and re-released the Note 7 with a "safe battery." Turns out that the safe battery was anything but safe. When the safe Note 7 caught fire, Samsung had to once again suspend all sales and recall the device. The most amusing part is that diehard fans are refusing to return their Note 7s and switch to something else. They'd better reconsider, because Samsung will push a software update that will kill the device’s ability to charge. Samsung said it will release the battery killing update on December 19, with T-Mobile following suit on December 27, AT&T and Verizon on January 5, and Sprint on January 8. Back in March, Microsoft rolled out a chatbot called Tay, whose purpose was to keep Millennials entertained via Twitter, Kik or Groupme. Microsoft described Tay as an artificial intelligence application that could "engage and entertain people where they connect with each other online through casual and playful conversation. The more you chat with Tay the smarter she gets, so the experience can be more personalized for you." But things went wrong, horribly wrong. In less than day, Microsoft’s chatbot started posting offensive and hurtful tweets, including neo-Nazi propaganda. Why did it happen? Because Microsoft forgot the internet is full of trolls and nasty people. If you told Tay to repeat what you say to it, she would do so. People exploited this vulnerability to get Tay to say a whole bunch of nasty things. "Although we had prepared for many types of abuses of the system, we had made a critical oversight for this specific attack. As a result, Tay tweeted wildly inappropriate and reprehensible words and images. We take full responsibility for not seeing this possibility ahead of time," said Peter Lee, Corporate Vice President, Microsoft Research. On Tuesday, December 13, Microsoft introduced another chatbot. This one is called Zo and so far, it hasn’t turned into a foulmouthed neo-Nazi like Tay.